All Saints Parish Church Choir is an active choir with a fine record of achievements, and is well known in the area. The choir sings weekly anthems, motets and service settings, together with providing music for special services and festivals covering a wide range of composers from all periods. 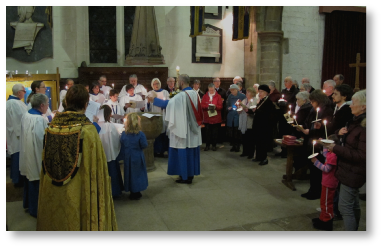 Throughout the year the choir leads the regular sung services of Sung Eucharist and Choral Evensong, together with the major feast days and festivals of the church’s year. It has taken part in many RSCM events both at York Minster and Durham Cathedral together with many churches throughout the North. Rehearsals are usually each Friday at All Saints Church from 6.15-7.30pm in preparation for two Sunday morning services and two Sunday evening services every month. Young choristers are prepared for the Royal School of Church Music ‘Voice for Life’ project. Please see the home page for further details and on how to apply.